Photosynthesis (photo-light, synthesis-putting together) may be defined as the process in whieh the green plants synthesize carbohydrates from carbon dioxide and water, using the energy of sunlight. The raw materials for photosynthesis are water and carbon dioxide. Simple carbohydrates like glucose are formed from these inorganic raw materials. The molecules of water and carbon dioxide are broken down in this process. Their atoms are recombined into a new compound. The energy content of the end products is greater than the raw materials in this reaction. Thus energy must be supplied from outside. This energy is supplied by sunlight. This radiam energy of the sun is stored in the form of chemical energy. This process occurs only in cells which contain the green pigment chlorophyll. 673 K calories per mole is t .e total measurable energy change of the reaction. It can be made to •10 some work. There is also some (13 K cal) non-measurable energy ch inge. The sum of the two is called the free energy change of the reaction. Its amount is 686 k calories. The raw materials in this process are water and carbon dioxide. Water is absorbed by the roots from the soil in the vascular plants. It is transported up to the photosynthetic organs through the xylem. The carbon dioxide is absorbed by the aerial parts of the plants from the atmosphere. The products of photosynthesis in green plants are a simple carbohydrate like sugar and oxygen. The oxygen is released into the atmosphere in gaseous form. It is utilized by the animals and plants during reSpiration. Oxygen is a by product of photosynthesis. The more important product of photosynthesis is sugar. Sugar is the fundamental material. It is the starter point. More complex foods ‘are formed from it. A part of this sugar is converted into complex carbohydrates like starch. A portion is also converted into oils. A part is used for the synthesis of proteins and other complex organic compounds. Photosynthesis is the ultimate source of numerous plant products other than food. Some of these compounds are cellulose, rubber, plastics, alcohol, resin, oils and drugs. Photosynthesis utilizes the sun’s energy. It takes place only during the sunlight. Photosynthesis converts radiant energy into chemical energy. Plants and animals use this energy of food for their growth. locomotion and other metabolic activities. The foods are oxidized and release energy. Thus all other animals and man depend on the sun energy stored by the plants. 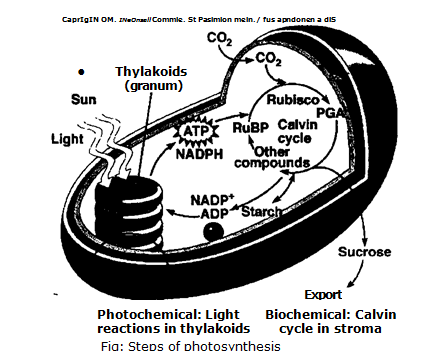 (i) Photochemical reaction or light reaction: In this reaction light is trapped by the thylakoid of the granum. This light energy is used to synthesize NADPH and ATP. Both these products are used during biochemical reactions. (ii)Biochemical reaction or dark reaction (Calvin reaction): This reaction takes place in the stroma o; chlorophyll. Carbohydrates are synthesized during this reaction.